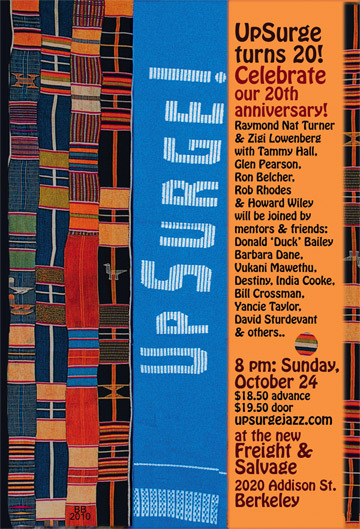 20th Anniversary Celebration of UpSurge! Audience Comments From the 20th Anniversary Celebration of UpSurge! Nat and Zigi…the 20th Anniversary event was spectacular! I just got home and am still moving to the beat. All I can say is you and Zigi are a class act ‘fo real…always have been…always will be. Totally great tonight. The Obama song was on the mark. OOO. And the army of artists! Too late for us old folks to party afterward, but both of us loved it. Needs to be a new album. Yeah, huge process, need money……. still. Thank you guys so much, and photos will take a few days to process. Hi Raymond and Zigi, I just got home from your heart filling 20th anniversary event. I hope you are doing a 20th Anniversary CD with everything on it that you and everyone did tonight….including the group poem reading….Wait! guess you have to make it a DVD so we get Zigi dancing with her Mom….every minute of tonight including the break! Destiny! the man-with-one-harmonica-that-sounded-like-six! You did 3 Michael Moore movies in one night. what power. And the flow from tough to soft…well–I don’t have your way with words but you KNOW! Jesus Christ! I had never heard FEMA before! help! I just finished CORE disaster training and hope to work with folks in W. Oakland to pull together a team so we never have to call FEMA. I have been through 2 other trainings and believe me the white hill residents are organized to snag all the resources. We’ll take care of our own and you’ll take care of our hearts…the poem Zigi read about what you do…. Do you have a book of poetry published? A children’s book with a CD! I see a big future finally for the Truth. I know you pulled it off in grand style the celebration of your results from your hard work and effort . Walk tall , be proud you deserve it , you are the best at what you do ! That is not your motivation yet still no one foes it better just the same! I mentioned Doug would be missed and I meant to mention Raymond’s mom in that mix! I hope you had fun , just a great time with laughter and tears of joy. Zigi and Raymond (please forward),Had to leave early (about 9:35), but loved your celebration last night. Thanks for the inspiration! What a fantastic event and emotional I did cry once. wish I had felt a bit better. It meant a great deal to me….There are so many memories to cherish. It was the best performance I’ve been to in a long time. You were great, Zigi was great…I loved her dancing with her mother…Zigi is so smooth, cool….and professional, the venue was beautiful and Destiny Muhammad tore it up at the end. Like I said before…it was spectacular. LOL – congratulations for 20 great years — time sure flies when we’re having fun!! Readers’ Pick for Best Poet or Spoken-Word Performer: UpSurge!